The final beach walk of 2013 yielded this curious piece of driftwood, which immediately struck me as haunted, crackling with life. 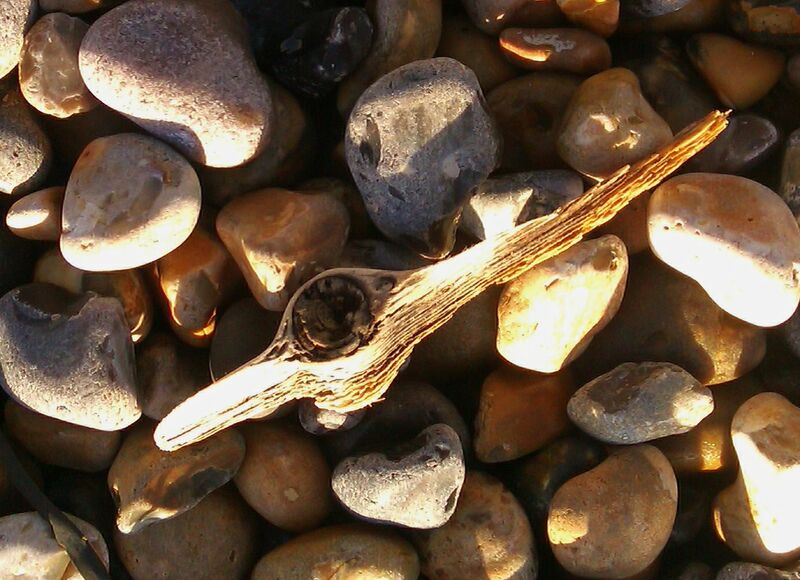 I photographed it in situ on the beach, but only after I had picked it up and turned it around did I see what it was. A feather – and given the recent return of Ancient Egyptian themes to the Shoreline, in the person of the crocodile-headed god Sobek, I was able to recognise it as (or, if you prefer, I decided on a whim to call it) the Feather of Maat. 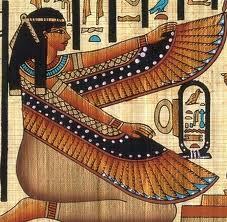 Maat was an Egyptian goddess associated with truth, virtue, and justice. The Feather of Maat was involved in the Weighing of the Heart, which, according to the prevailing religious myths of Ancient Egypt, was an essential stage of the journey into the afterlife. The heart of the deceased was placed on the scales and weighed against the Feather as a test of purity. 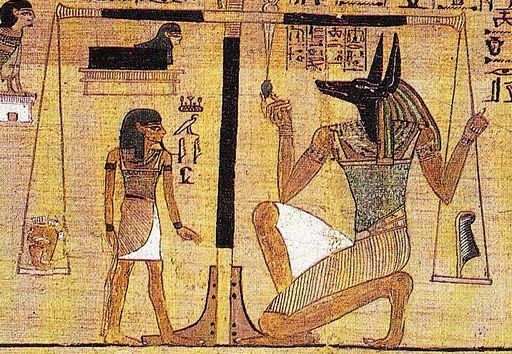 Here we see the heart on the left scale, the feather on the right, the weighing being conducted by our old friend Anubis, Guardian of the Shoreline (and we have previously considered the Weighing itself too, when meditating on the scarab stone). If the heart weighs the same as the feather, the deceased may progress, journeying through the gates of the afterlife towards Aaru, paradise. But if the heart fails the test, it will be devoured by Ammut, and the deceased will be condemned to remain in Duat, the underworld. claimed by the eccentric turn-of-the-century Massachusetts physican Duncan MacDougall to be the mass of a human soul. MacDougall’s experiments (which involved weighing dying patients before and after death) were bizarre and unscientific, but the notion of 21 grams as “the weight of the soul” has persisted as a trope in popular culture, most recently in the 2003 film called simply “21 Grams”. Remember, to pass the Weighing, the soul must weigh exactly the same as the feather. 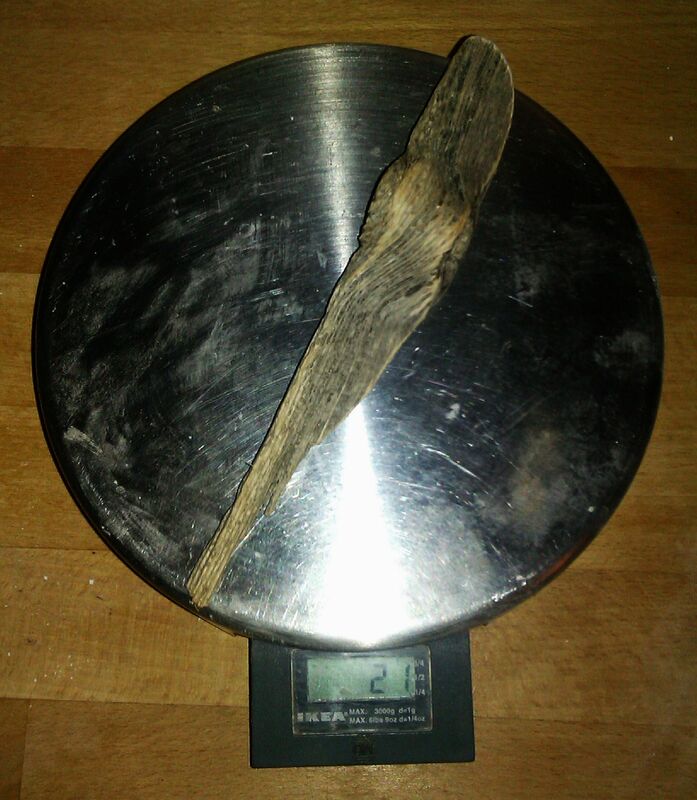 So make what you will of the fact that this driftwood totem weighs 21 grams. That aside, the Weighing of the Heart is an apposite image for this particular time – because, as I type, we are, here in the UK at least, in the first minutes of 2014, standing uncertainly at the threshold of past and future. Around the world, in private or public, people are hoping for better, replenishing their optimism, wishing each other well, and swearing oaths and promises, resolutions for the perilous journey ahead. Will we make it to Aaru, or find ourselves lost in Duat (again)? Good luck, as you face your own personal reckoning at the turning of the year. You may need it. Time and tide wait for no man. Three whole months have passed without activity here, leading one correspondent to wonder if the previous post was in fact a veiled suicide note. Not the case: I continue to haunt the Shoreline – in corporeal form, I hasten to add – and have over the last few months accumulated a motley collection of notes and photographs, which may or may not manifest as future posts. Before any of that, however, I want to pick up the threads of this post, and continue exploring St Margaret’s Church, Rottingdean. 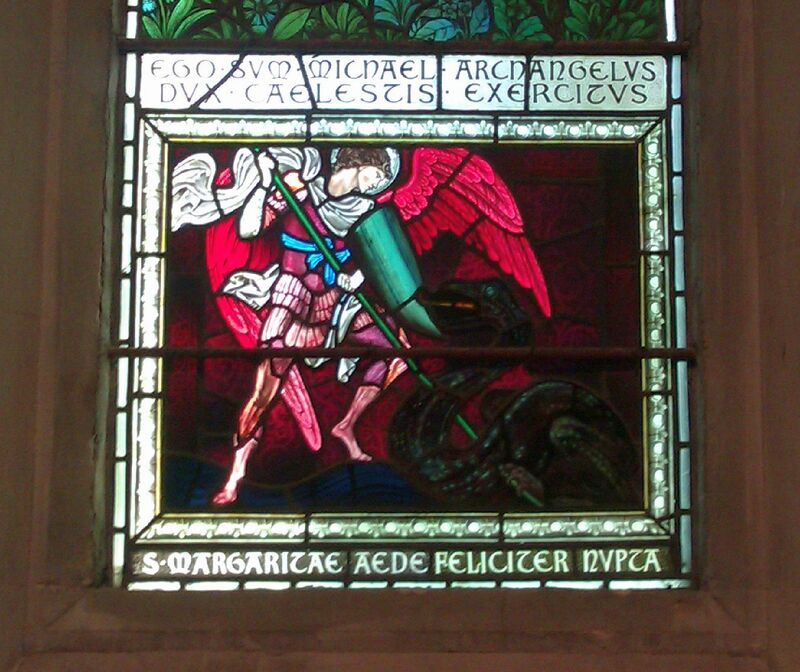 Firstly: Margaret is said to have slain a serpent or dragon. The Burne Jones window shows her vanquishing this demonic creature – in fact, almost every existing pictorial depiction of Margaret shows her in the act of triumphing over a fearsome mythical beast: sometimes transfixing it with a lance as above, sometimes striking it with a hammer, sometimes standing or riding on it. In some versions of her legend, she is said to have been swallowed whole by the creature, escaping death when the crucifix around her neck proved so unpalatable to the monster that it vomited her out unharmed, splitting itself apart in the process. Here there are echoes of Apollo and Python, and more broadly of the serpent motif that has reared its fanged head here repeatedly, in both benevolent and baleful aspects. Secondly: she is the patron saint of pregnancy and childbirth, topics previously manifest on the Shoreline through the ‘wombstone’ and the ‘seed pod’, not to mention the beach find that pointed me towards the church in the first place, the ‘mermaid’s purse’ eggcase. 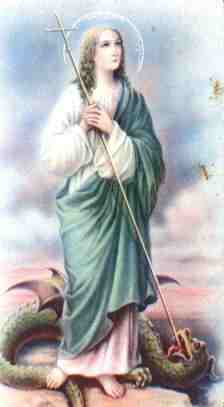 Thirdly: she is said to have been put to death, martyred, by being beheaded. Grisly and brutal, but entirely in keeping with the decapitated dolphin washed ashore at Saltdean, and the acephalic fixations of our old friend (or maybe fiend?) Georges Bataille. A bumper bundle of coincidences, then, and a curious set of findings given that this whole quixotic Shoreline project is a kind of experiment in creating – and, indeed, inhabiting – a mythography of place: a particular type of engagement with the subtle influences that permeate this locale. As ever, I make no claims at all regarding truth or consequences, but were I so inclined, these discoveries could readily be seen as vindication of the Shoreline method and process: confirmation that the swirlings of the Shoreline current are indeed reflections of the deeper patterns embedded here in place and psyche. There is plenty of material online regarding Margaret of Antioch: if you wish to know more about this saint and the legends attached to her, there are good starting points here and here. One further strange discovery in the Rottingdean church is worth documenting here. On either side of the building’s entrance arch are two stone faces: one male, one female. I can find no documentation of these, but they look remarkably like the king and queen of alchemical symbolism. In the absence of any other information, I simply leave you to gaze upon them. After the previous post I hadn’t planned to write anything more regarding Easter this year, but the Shoreline had other ideas: during a short, bracing walk on Saltdean beach on Easter Sunday (short and bracing because it was the coldest Easter day ever recorded in the UK), my 8 year old daughter found this impressive greyish pink stone ‘egg’. The biting cold defeated my attempts to photograph it in situ on the beach, but we brought it home to add to the ever-growing Haunted Shoreline Cabinet of Curiosities, and here it is. Not for the first time, an image alone cannot quite do it justice, as the ovoid appearance is accentuated by its remarkable smoothness, but until such time as this blog is available in sensurround format (in glorious Psychedelic Omnivision, of course), you’ll have to take my word for that. For obvious reasons, eggs are symbols of fertility, but their esoteric symbology goes well beyond that. We have previously considered the egg of Ouroboros, the cosmic serpent, while in alchemical texts the term Philosophic Egg, or similar, is used as a kind of shorthand for the physical vessels (flasks, alembics) within which the alchemical process unfolds: the container within which the Philosopher’s Stone is gestated. 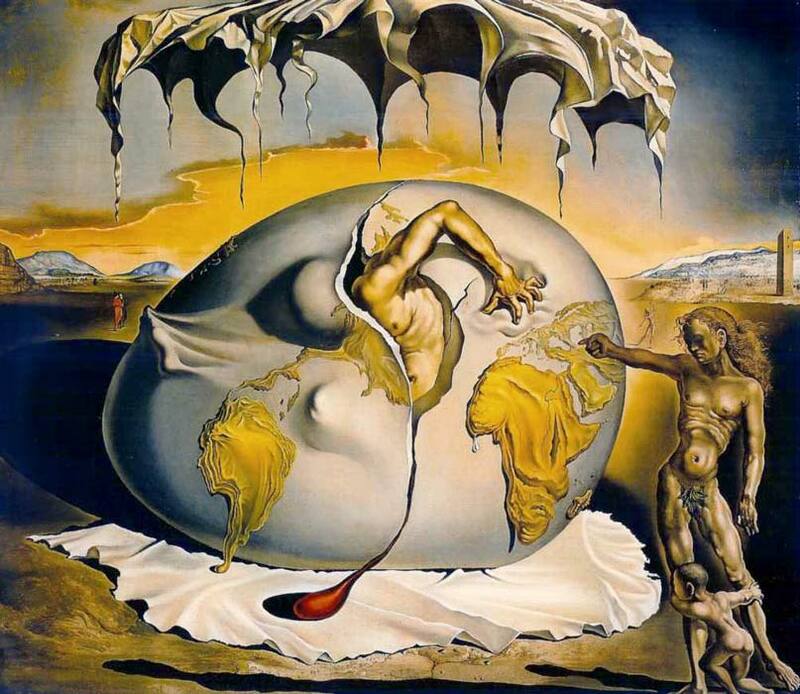 Painted during WWII while Dali was living in the USA, it is commonly interpreted as a representation of the growing strength of the US as a new world power- certainly this seems to fit, although the esoterically-minded will also note the appearance of a World Egg. To what extent Dali was deliberately referencing alchemical imagery is unclear, but it is a device that recurs in his work- indeed here you can see Dali himself, together with his wife and Muse Gala, being ‘birthed’ from a large egg in a typically outlandish piece of… well, let’s just call it performance art. I am unsure of the date of this film but it is clearly a lot later than the painting above- I would guess it is from the late 1960s, well into Dali’s self-promotion period (see my previous thoughts on that here) and, to me at least, of considerably lesser interest, but the near-identical symbolism is nevertheless worth noting. Two Surrealist artists who were more explicitly informed by alchemy were Leonora Carrington and Max Ernst. 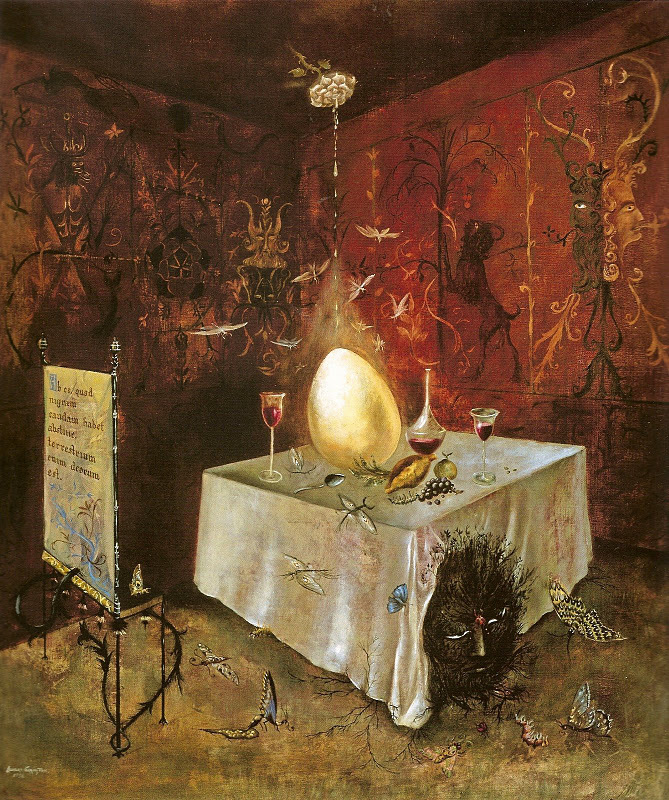 In her essay Down Below, Leonora Carrington describes the egg as “..the dividing line between Great and Small, which makes it impossible to see everything at once“. The dividing line– that is, the liminal threshold, akin to my interpretation of the Shoreline. The magnificent golden egg is the centrepiece here, but as usual with Leonora, the whole canvas bursts with enigmatic imagery. The Latin inscription on the chair back reads Ab eo, quod nigram caudam habet abstine terrestrium enim decorum est. I am indebted to Susan Aberth’s book Leonora Carrington: Surrealism, Alchemy and Art for the information that this is excerpted from a 14th century alchemical text known as the Ascensus Nigrum,which by my reckoning translates as the “the ascent of blackness”, presumably a reference to the transmutation of base matter which is the heart of the alchemical process. The inscription itself translates as something along the lines of “Keep away from that with a black tail; this is the beauty of the Earth”. Whatever this may mean, it seems to relate to the bizarre creature that lurks beneath the table, its black, frond-like tail curling around the room. In The Giantess, or Guardian of the Egg (1947), the egg is, by contrast, rather small..
.. but then, so is everything else in comparison with the towering central figure, which can be readily interpreted as a goddess form, guarding the more usually male-dominated Hermetic mysteries. 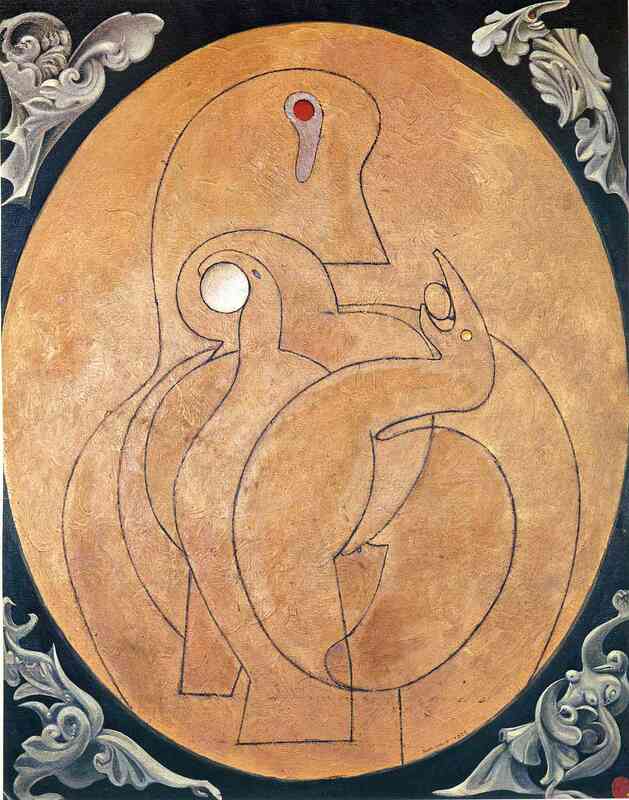 …and the birds preparing to hatch from it are readily recognisable as representations of Loplop, Ernst’s oft-depicted avian familiar and totemic guide. So this image would appear to refer to Ernst’s own creative processes: his inner alchemy. 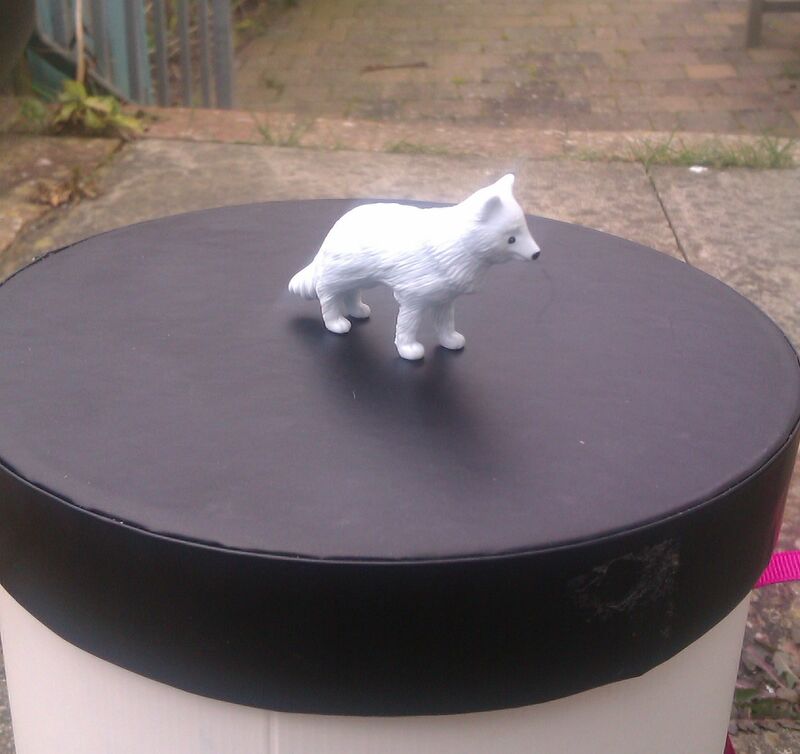 I wasn’t immediately sure what it was (although she knew straight away)- but it came with a nametag, in Latin, no less: Vulpes lagopus, and a quick Google confirmed her insistence that it was, therefore, an Arctic fox. Which, in view of the extreme cold, seemed to make perfect sense. A serious outbreak of Actually Existing Work has kept me from blogging recently, but lo, the winter solstice has arrived, and it happens that this year it marks the start of my festive break from the aforementioned Work. So now that I have time to breathe, let me share with you a strange instance of hyperlinked synchronicity, that follows on from the previous post about the great Surrealist artist Leonora Carrington and the recent visit of English Heretic to the Shoreline. The story begins in a familiar location- the psycho-alchemical arena of Saltdean beach, nexus of the Haunted Shoreline. Every nekyia needs its hypogeal ramp and the beach at Saltdean is reached by a tunnel cut into the cliffs. The shallow descent through the tunnel gives Haunted Shoreline’s perambulations a magical imperative. The beach is cut off from the mundane. As we left the beach through the tunnel, a sign above the entrance showed the numbers 902. Andy and I had already pondered the potential significance of the numbers 902, our musings being based around the extensive symbolism of the number 11 (gematria: 9+0+2=11). But after his visit, I found myself returning to the numbers, and also to the figure of Leonora Carrington, whose work had animated our beachcombing explorations that day and haunted my imagination thereafter. 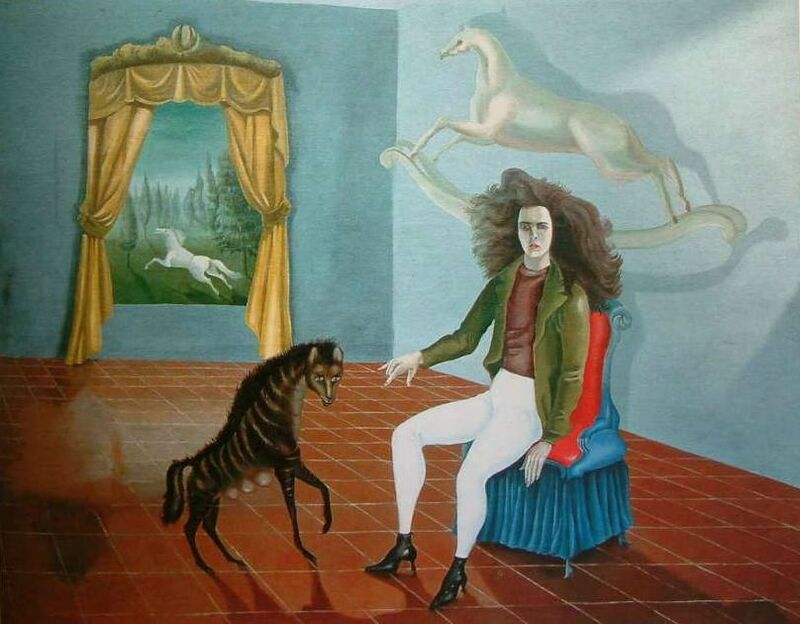 And so, on a whim, I typed “leonora carrington 902” into Google. It’s a page from the website of New York’s famous Metropolitan Art Museum. All the rooms and galleries of the Met are numbered, and Gallery 902 is devoted to… Surrealism. This is one of her best known works and the most direct representation of her curious affinity with the hyena, which she regarded as a kind of personal familiar or totem animal. Amused and perplexed, I fired off an email to Andy to let him know about this peculiar coincidence, through which the Shoreline current had apparently looped back on itself via cyberspace. And then, seven minutes after sending the email- and I have the screenshots to prove it- what should happen? Why, this very same painting popped up on my screen, in my Facebook feed. (The painting was posted to Facebook by the Leonora Carrington FB account. I do not know who runs this account – Leonora herself died last year, at the age of 94 – but it would appear to be someone with access to a significant archive of her work, as images of paintings, drawings and sculpture are posted throughout the day, every day. I think the account owner may be based in Mexico, where Leonora Carrington lived for most of her life). And at that point the tingling electric shiver of the Uncanny was well and truly manifest, crackling through and around me. Now, I do not attach beliefs to such happenstances. I have written before about the absence of belief in the Shoreline method. But even without attaching any certain meaning or value to synchronicities like these, or to the Shoreline current in general, one can choose to follow a thread and see where it leads. And so I find myself considering a trip to Mexico. 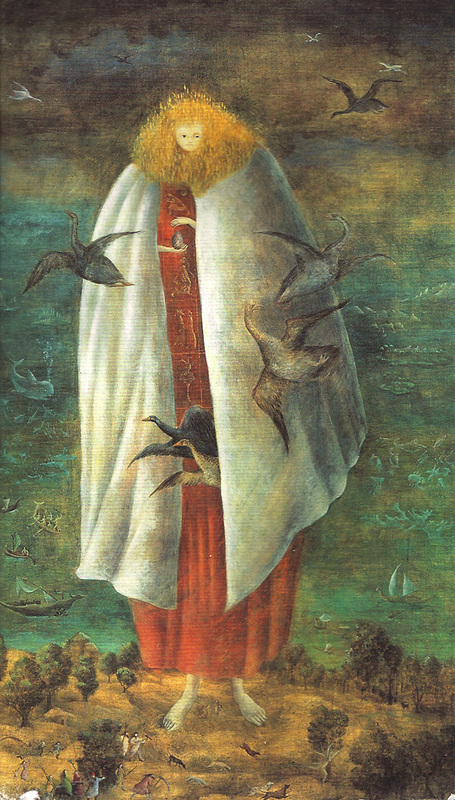 Mexico is a place I have never visited, but in addition to being Leonora Carrington’s home for most of her life, it featured in a highly significant dream I had early in 2011, many months before I initiated the Shoreline project (or it initiated me, perhaps). This dream was too personal to discuss here, except to mention that it ended with me warding off a snapping dog or fox-like creature..
.. and this strange mesh of symbols, resonances and portents leads me on.. ever further along the Shoreline, ever further down the wormhole. A witches’ brew of ideas and practises influence the overall approach here at the Haunted Shoreline, the main reference points being Hermetic and alchemical symbolism filtered through an idiosyncratic mesh of Surrealism and analytic psychology. But beyond, or underneath, all that is an attempt at a direct, gnostic engagement with place, a deliberate permeability between the actual, tangible shoreline and its representation in the imagination of the writer. This interaction is mediated by the sensorium, the physical Being, of your correspondent. The human nervous system is both the interface between inner and outer worlds, and the crucible in which their synergy ignites. In this regard, there is a book that should be mentioned as an influence of sorts: “The Peregrine”, by J.A. Baker. John Alec Baker was born in Essex in 1926, and lived for most of his life in Chelmsford- the same town, it so happens, in which I grew up. In fact, my copy of The Peregine came from the ‘local authors’ section of a bookshop in a small Essex coastal town where my parents would often take us for family holidays in the 1970s. I bought it there only last year, on a day charged with solemnity and deep reflection. My mother had recently died. My father, my sister, and I had returned to this old haunt for the day to scatter her ashes. This we did at the shoreline – that location being a collective decision, I should add. Later that day I chanced upon the bookshop while meandering through the town. The Peregrine was first published in 1967; there have been a number of new editions in recent years, including one introduced by Robert Macfarlane, author of The Old Ways– you can read a terrific essay of his on Baker’s book here. My copy is the version shown above, the most recent edition, which also contains Baker’s other published writings (these are scanty) and some letters, as well as two cracking introductory pieces by Mark Cocker and the editor John Fanshawe- these are important, as they contain virtually all that is known about the life and personality of J.A.Baker. Previously, Baker was invariably described (and at the time of writing this still is, on Wikipedia) as someone about whom “little is known”, save that he “worked for many years as a librarian”. In fact, this solitary morsel of biography turns out to be untrue: he was never a librarian. Instead he spent most of his working life in some managerial role at the Britvic soft drinks company, which has its headquarters in Chelmsford. He was married but childless, and was for many years the chairman of the local branch of the Automobile Association, despite never learning to drive. As far as I can ascertain there is only one extant photograph of him: it is on the back of the book, but appears not to be available anywhere online. It shows him aged about 30, round-faced, with 1950s-style Brylcreemed hair and thick, owlish glasses. This final detail is significant, as Baker’s poor eyesight is one of the factors that has led his readers to wonder just how factually accurate are his recorded observations of birds and animals. The book is in the form of a journal, covering a period of half a year. Baker makes it clear, however, that this is a storyteller’s trick, and that in fact the material derives from numerous solitary journeys into the countryside around Chelmsford over the span of a decade or so- all this, or the edited highlights perhaps, has been telescoped into the timeframe of the book. Essex was far less urbanised then than now, although an interesting feature of the book is that many of Baker’s days out take him through agricultural landscapes- managed fields and woods- rather than the elemental wildernesses that are the more standard settings for ‘nature writing’. He hops on his bike, cycles to these nearby rural locations (which are described, but not named), and once there this apparently quiet, conventional man seems to have entered into quite extraordinary states of mind. He immerses himself utterly in the world: his connection to his surroundings is not so much mystical as simply direct. He wrote up his impressions in the evenings, with a startling gift for phrasing, bending and moulding the language to the demands of whatever moment he sought to describe, to invoke. The result was an astonishing prose-poetry that dares to tackle the vivid multiplicity of cross-sensory impressions that make up our experience of outdoors. Wherever he goes, this winter, I will follow him. I will share the fear, and the exaltation, and the boredom, of the hunting life. I will follow him till my predatory human shape no longer darkens in terror the shaken kaleidoscope of colour that stains the deep fovea of his brilliant eye. My pagan head shall sink into the winter land, and there be purified. And this is what happens. He watches the peregrines, records their habits, absorbs their world, and through some strange English shamanism, achieves knowledge (gnosis) of them. His account of it all is extraordinary- although the blazing intensity, and the torrent of images and impressions, require that it be read in short sections. Doubtless the circumstances in which I first encountered this book contributed to the potency of its effects on me. But even without those added layers of personal resonance, it’s heady stuff. Baker at times seems exalted, his language aflame with ecstatic poesy. That line in the quote above, My pagan head shall sink into the winter land, has stayed with me: often as I walk towards the beach I am visited by a mental image of submerging my own head in the pebbled, quaggy sands at the shoreline’s edge, and there being purified. And the phrase the shaken kaleidoscope chimes with me too: Baker uses it here to describe the peregrine’s eye; I have always liked the image of a kaleidoscope as a demonstration of the endlessly shifting Real: how basic elements, obeying physical laws, can be infinitely reconfigured so that they look a little different each time we gaze upon them. So it may well be that the terrain Baker explores in The Peregrine is some alchemical fusion of the inner and outer worlds. His insistence on not naming or identifying his locations lends weight to the idea that the actual physical environments were a sounding board for something more deeply personal: his own private falcon-haunted mindscape. The ornithologists who have relied on his descriptions of peregrines and other birds may find this interpretation problematic, but, personally, I hope it is true. The Peregrine would thus become at once a document and an act of creation- an act of magic, one might say. If the book is taken at face value, however, then to say that Baker does not impose himself on his material would be an understatement. The reader learns nothing whatsoever about him as regards the facts of his life. Inasmuch as his personality can be read through his writing, he seems to combine a dry, at times obsessional, precision with a vividly hyperacute sensitivity. In this, he is perhaps what I might call a “Shoreline character”- a person in whom stark contrasts do battle, with something vital, alive, emerging at the interface. Peregrine falcons are uncommon here in Sussex (and at this point it seems appropriate to mention the work of the Sussex Peregrine Study, whom I came across in the course of researching this post). The appearance of a peregrine on the Shoreline, on the day I started writing about this book, is one of the more sonorous and resonant synchronicities this place has thrown up. And I would give a lot to know what John Alec Baker would have had to say about it.